Several years ago I wrote a blog about dental implants that was titled “Implants: The Game Changer in Dentistry.” I wanted to write a new blog about this because it is perhaps the fastest growing area of dentistry and one of the topics my office receives the most questions about. First, the reason implants are considered a game changer is because of how they have caused a dramatic change in the profession and how much they can improve patients’ lives. They can be compared to other advancements that have changed dentistry profoundly, things like anesthesia, fluoride, and x-rays. Those innovations existed long before I entered the profession and game changer really describes them because it is hard to imagine dentistry without them. The same can now be said with regard to implants. I learned about implants in school but almost no one, including the instructors, was doing them. In my first years of practice, I only restored a handful of implants but in the last 10 years, I have restored hundreds, including both large and small cases. Years ago most of my patients had heard little about dental implants and most did not know anyone that had one. Now it is rare that I find a patient who doesn’t know someone who has had a dental implant. In my own family, my father had dental implants even after the age of 80 and my younger sister had an implant in her 20s due to a childhood accident which caused her to lose a front tooth at a young age. Why are implants better than other alternatives for missing teeth? 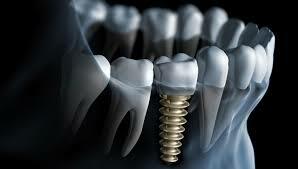 If a single tooth is lost, an implant can be used and when it becomes fused to the bone, a crown can be placed over it. The adjacent teeth will not be touched. A fixed bridge is also a way to replace a missing tooth but it involves grinding down adjacent teeth to support a missing tooth. Those teeth used to support a bridge are now more susceptible to needing other treatment, including root canals. Before implants were common, I was doing many bridges every year. Now I only do them on rare occasions because an implant is usually better treatment. In replacing a single missing tooth, an implant is taking a one tooth problem and leaving it as a one tooth problem. A bridge is solving a one tooth problem but potentially creating a three teeth problem. 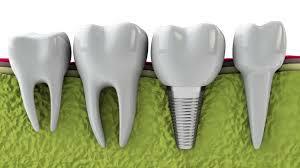 Since implants are made of titanium, they can never decay. However, they are susceptible to periodontal disease just as natural teeth are. Implants can also be used to support a denture or partial denture, providing much greater stability and retention. This procedure has, in my opinion, provided greater satisfaction for my patients than any other treatment I have done. What about costs? Implant are not inexpensive and certainly cost more than other procedures. If an implant is done to replace a single tooth, the cost will generally be about 25-30% higher than the cost of a bridge. However, even with the greater expense, I have yet to have a patient that regretted having a dental implant done. It is the best procedure dentistry has for replacing a missing tooth and it is almost always the treatment that I recommend.